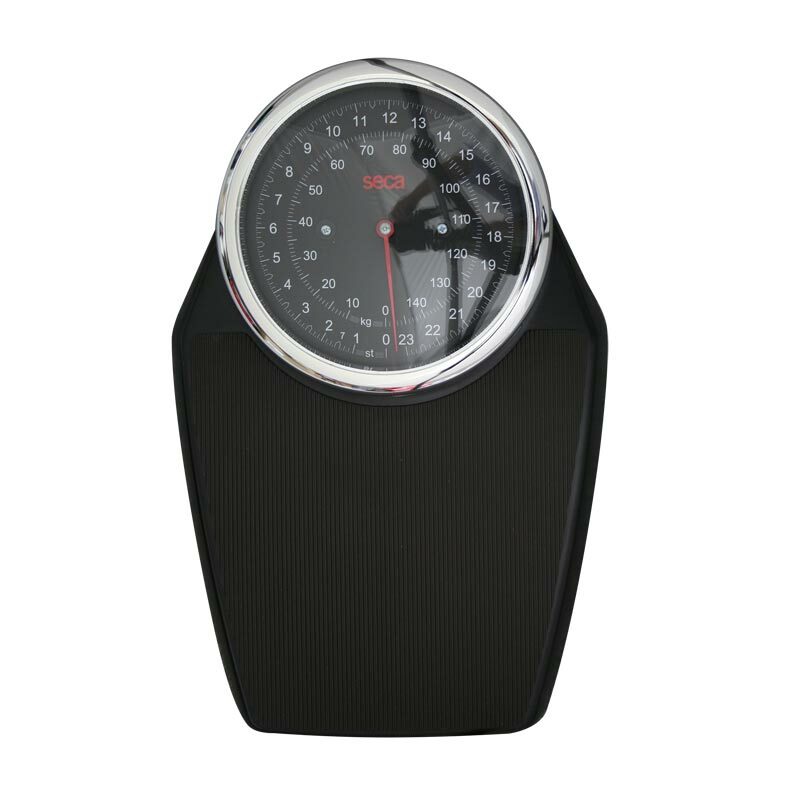 The SECA Colorata 760 Mechanical Scales are a stylish set of mechanical scales. The Colorata 760 has a chrome plated safety ring around the face of the dial, a platform of skin friendly grooved natural rubber, and a classic scale dial and robust, precise weighing mechanics. Large, easy to read dial. Scales show kg and lb. I imagine that a good number of us have purchased bathroom scales that when used you have to constantly adjust, change batteries and then hope that they are telling the truth, I have and was totally fed-up with the difference in weights and having to adjust them I have given up. On a visit to my health centre I asked to have my weight checked and saw that they had SECA scales and was told that they were accurate and did not need adjusting all the time. On arriving home I looked up the scales and made my purchase they came well packed with no chance of being damaged in transit, they were carefully unpacked and readied for use, we keep them in the bathroom so they keep the same temperature and I have only set Zero once when setting up, they always come back to zero and are very easy to read with the large clear scale. The cost is quite a lot more than the run of the mill scale but as the saying goes you get what you pay for and with all the ones purchased before I could have had a set of SECA scales and saved money and had accurate weight measurements. So all in all an excellent product and a onetime purchase these are for life. The scales are bigger than I was expecting. The numbers are bold so stand out clearly but the divisions between the numbers are faint so not very to easy to read when weighing yourself. I like that they weigh in lbs and kilos. Could be better designed. 5 out of 5 Excellent Service, Price great, and Scales Perfect for my needs. The service was easy and quick, right from the ordering to the delivery. This was the best price for these scales that I found and are just what I need in my job as an Exercise Referrals Instructor and Specialist. Will Recommend Newitts and the Scales. We got fed up with either changing batteries or inconsistent results so when our digital scales finally died we decided to go mechanical. Not as straightforward as it sounds as reputable brands are expensive. After extensive searching I found these scales and further searching showed Newitts offered the best price around. The scales were delivered promptly, well packaged and at an excellent price. The scales themselves are robust and well built. The display is easy to read and offers metric & imperial. The results so far are consistent and reliable. I am a healthcare professional and they appear as robust as any I have used in a hospital environment. Thank you Newitts for making this Seca scales affordable, the scales will last us a lifetime and look good too. Easy to set up and feel solid underfoot. Well designed ergonomics and easy to read the dial. Very happy with the product. Excellent product. Stylish and practical. Very very happy. Will certainly recommend them to all my friends. Have been looking for quality scales for ages and can now stop looking !